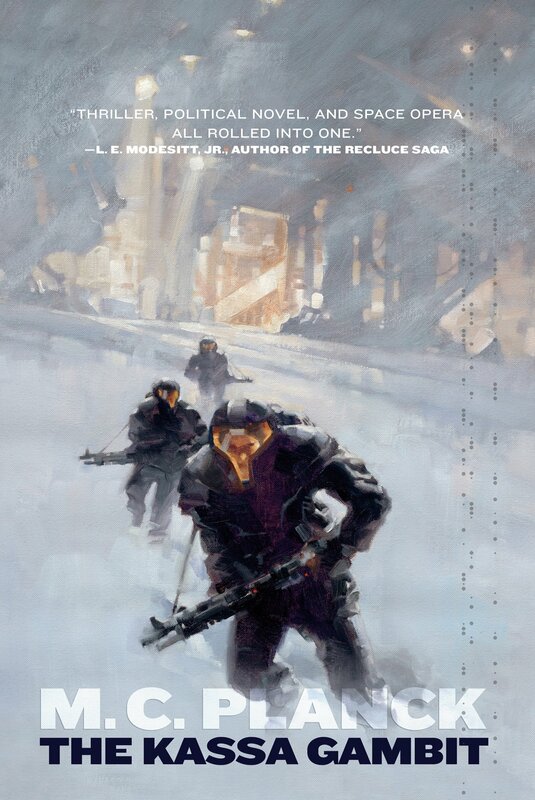 If you enjoyed the TV show Firefly, or have been enjoying the James S.A. Corey Expanse series (Leviathan Wakes, Caliban’s War, etc), then The Kassa Gambit is for you. Starting off with a bang, the crew of the Ulysses exit node space in the Kassa system to find mines and missiles waiting for them. Luckily, Captain Prudence Falling has a smart crew, and a freighter ship that’s got some hidden additions. They outsmart the missiles, land on Kassa to learn the entire planet has been bombarded by a mysterious enemy that showed up out of nowhere, bombed the crap out of the place, and left without a word. When the government patrol boat Launceston enters the system, Falling helps them through the mine fields, and doesn’t want to stick around long enough for the Launceston’s League Agent Kyle Daspar to use his governmental powers to commandeer her ship too. She’s interested in helping the people of Kassa rebuild, but under her own terms, not those of the League. Daspar has secrets of his own, and one of them is that he’s intensely suspicious and paranoid. The mission he’s really on isn’t the one he’s talking about, and for a while he’s convinced that Falling is an agent out to kill him. What changes his mind is the way Falling treats her long term crew members. She’s tolerant of Garcia’s crassness and alcoholism, and she’s maternal and protective towards Jorgun, who is an idiot savant. Jorgun can program the nav computer faster and more accurately than an AI, but he’s got the mental development of a five year old. Falling knows Jorgun’s skills, and she also knows how others would treat him, and what the League would do with him if they got their hands on him. When not running Nav, Jorgun is happy doing jigsaw puzzles, playing games, and watching cartoons. He’s the ship’s gentle giant. As the Kassa investigation continues, a crashed alien ship is found, and Prudence and Kyle follow different tracks towards the answers. Their paths cross again, and there is some obvious chemistry growing between the two of them. They are both physically attracted to the other, but they mutually agree that the timing couldn’t be more inconvenient. They do decide to work together to uncover the mystery of what attacked Kassa. Prudence has an augmented ship and knows the shipping lanes and node jumps like the back of her hand, and Kyle has the government connections to get their all information they could possibly need. Now it’s just a matter of putting all the pieces together.